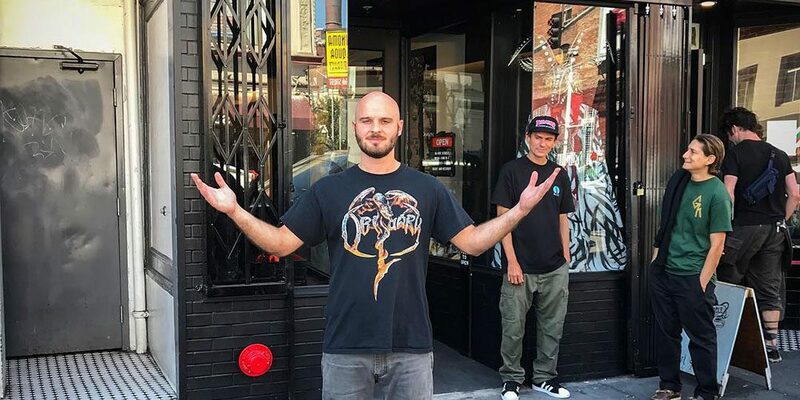 Rumors have been swirling around for over a year that Thrasher was launching a flagship store in San Francisco. But, for the most part, those in the know have been tight-lipped about skateboarding’s bible’s latest power moved. That changed yesterday when Tony Vitello officially unveiled his new project via Instagram. The location at 66 Sixth street is fitting in terms of address and location, a nod to Thrasher’s dark imagery on a block that is a little rough around the edges. This is certain to be a destination spot for skateboarders from around the world. Have a look at the official announcement and store preview below. Once I knew the address was available, the search was over. This was gonna be our place! When the listing agent didn't return my calls, I showed up to her office in person and left a message with the secretary. A few days later I was notified that 66 6th street had been listed for rent by mistake, and the address was in fact, not available. They informed of other places they considered more desirable, but I wasn’t interested. I begged, making up some story about how my father arrived in this country in June of 1966. If anything changed they needed to give me a ring. Finally, after over a year, they called, “Was I still interested?” Yeah, the space itself was in rough shape, but thanks to some really talented people, we slowly, over the course of a year and a half, transformed it into just what I envisioned. 66 6th is not a “store”, nor is it a “museum”. It's best described as a manifestation of our allegiance to skateboarding and San Francisco. This city has been our home since birth, our headquarters tucked away on the outskirts of town in Hunters Point. This is our opportunity to create a Thrasher experience smack dab in the middle of the city, in a neighborhood not yet decimated by the steamroller of gentrification. There are many people who have played an integral role in the creation of 66 6th Street, and to all of you, I am forever grateful for the tireless work and insight. As much as Thrasher is an institution within the skateboarding world, we are staking a claim where it's still Wild in the West. 66 6th will continue to evolve over the years, a physical space to showcase more of what Thrasher means to us. But this very first version takes a stand. San Francisco made skateboarding what it is today and continues to shape Thrasher during a time when the city has lost its pioneering spirit, enamored with the infusion of new tech money. This is an invitation to our humble hangout, where you can not only remember, but live this city’s street-level soul and energy.